In a new interview with Yahoo Style, Paris Hilton is opening up about former bestie Kim K. Believe it or not, Paris used to be the big cheese while her stylist/assistant/friend Kim Kardashian was barely known outside of Hollywood. Over the years though, Paris's fame began to fade away while Kim became the superstar she is today. Find out what Paris had to say of Kim's success. 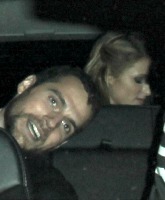 Paris Hilton and newly single Superman star Henry Cavill were photographed leaving a pre-Golden Globes party together on Thursday -- and Henry didn't seem too shy!